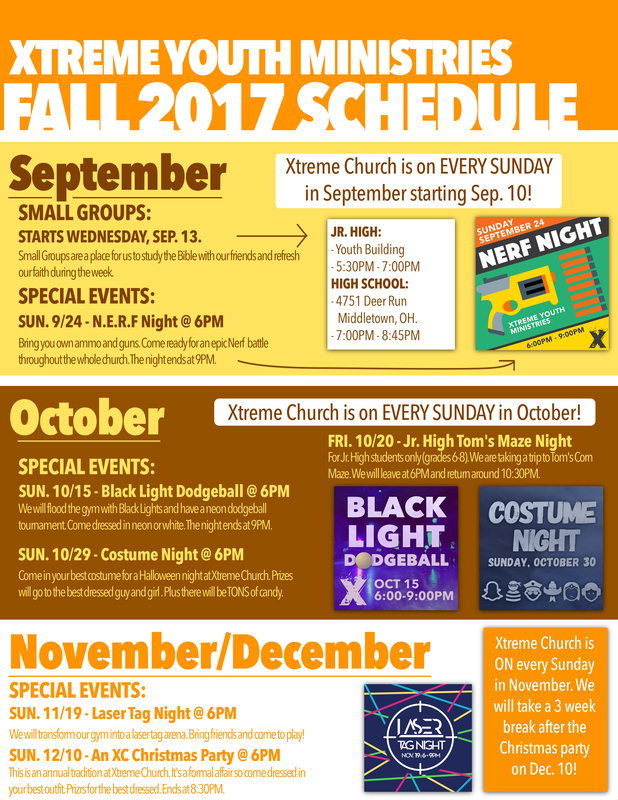 Xtreme Youth Ministries is our ministry for High School & Junior High students. It is open to all students, grades 6 - 12. Our goal is to help your student become a person after God's own heart. We meet on Wednesday & Sunday nights. Scroll down to learn more. To visit our Parent Facebook page click here. Sunday night we meet for Xtreme Church, our worship service for Jr. High & High School students. Every Sunday night features a welcoming, fun atmosphere with games, videos, worship and a message. Wednesday night we meet for Small Groups. Small Groups are a midweek bible study where we connect with friends and refresh our faith. Most months we do a special event on a Sunday night for students to invite their friends. Stay up to date on what is happening by downloading our upcoming events page below.